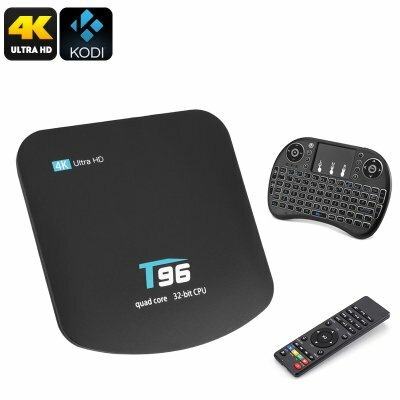 Successfully Added T95 TV Box And Wireless Keyboard - 92Key Querty Kbrd, 4K x 2K, Quad Core CPU, Kodi 16.1, DLNA to your Shopping Cart. Wireless QWERTY keyboard and games controller will put you firmly in the driver's seat. The T96 TV box will bring hours of fun to your home. With Kodi media player and Google Play store, there is no end to the entertainment. With a Rockchip RK3329 CPU and Mali GPU, this TV box can handle 4K resolutions so you'll get games, TV, and movies in full detail. Now you can stream the latest movies and sports matches in 4K resolutions. Simply connect this 4K TV box to any HDMI display and enjoy a world of entertainment on the big screen. Connect via Ethernet or Wi-Fi and you'll be able to stream content to any room of your home. This smart TV box comes with an amazing wireless keyboard that incorporates a 92 key QWERTY keyboard as well as quick multimedia buttons and game controllers. Running on 2.4GHz it can connect wirelessly to your TV box or other media stations and games consoles letting you control them from up to 15meters away. Now you will never need to get out of the sofa again and can enjoy a wealth of rich entertainment and games without leaving your seat. There is 8GB of internal storage and a micro SD card offer 64GB of external memory space. Top that off with USB memory pens and you'll find there's plenty of space for photos, music, movies and games. This Android 5.1 TV box with a wireless keyboard and a remote control is an awesome and affordably priced bundle that will make any HDMI TV a home entertainment hub for all the family. This 4K Android TV Box comes with a 12 months warranty, brought to you by the leader in electronic devices as well as wholesale smart TV boxes and media gadgets..